PDF documents are wonderful when it comes to security options. Ironically, these options are what cause more than a headache to users. Its restrictions can be somewhat annoying and confusing, which immediately means that we do not want to work with the format unless it is extremely necessary. However, a very pleasant solution has arrived at our door for the user that does not compromise what we are looking for in these files: security and portability. 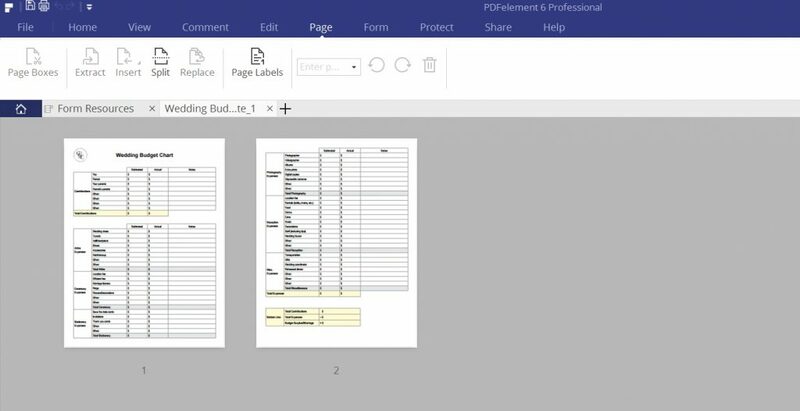 Meet PDFelement, a program that more than being a PDF viewer, has a wide range of options that will allow us to customize our document as if it were a .docx file. Before we start, we invite you to try the software’s free trial available for Windows and Mac. We are sure that after you read the review and try some of the functions of the program on your own, you will not want to waste time in purchasing the Pro version. We have already seen how the interfaces have been mostly adapted to the Windows 10’s design. Many minimalist paintings throughout our screen. PDFelement maintains this design to not clash with the rest. The first thing we will see when opening the program is our recent PDF documents and 6 options that put us directly in the action. The initial option highlighted is to edit a PDF document that we have in our computer. With the second option, we can convert our PDF files to other formats, among which we get Word, Excel, PowerPoint files, image formats (JPG, PNG, etc. ), TXT, HTML and even Ebooks. 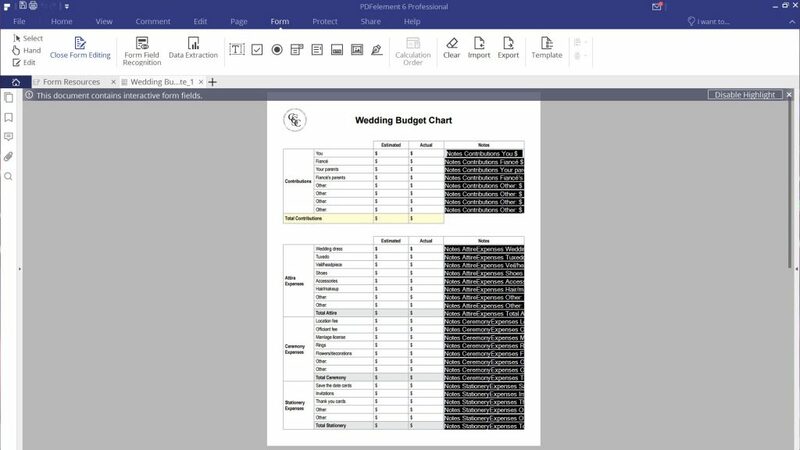 The first lower option will allow us to create a PDF file from another existing document, that is, it is an import option. If additionally, we have a large document that we have divided into small files, we can unite everything in a single PDF with the combine option. With Batch Process, we can order the program to perform multiple actions at the same time without having to constantly monitor it, such as batch convert, watermark, OCR and extra data. And, finally, an option that is quite a wonder for the catalog that offers, are the PDF Templates. This is a kind of store with different documents previously designed for our convenience. We can edit as we want these formats, even practice functions if that is what we want. For our analysis, we will use one of these formats and we will see the PDFelement functions on it. Now that we have opened our document, we are in the window where we can edit and accommodate the file. 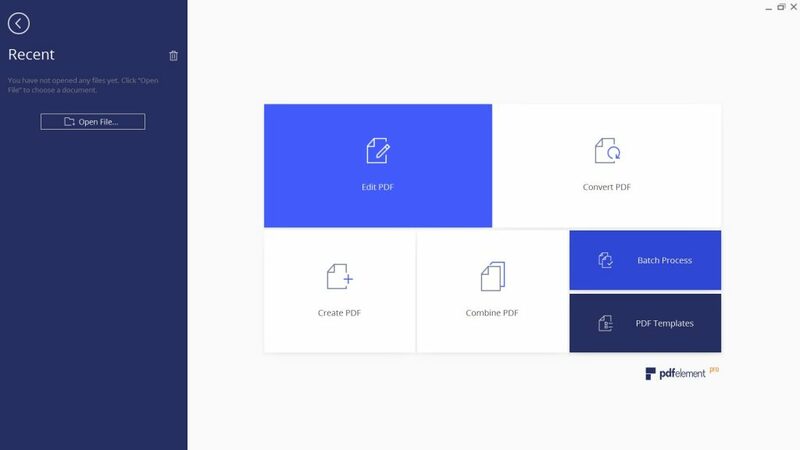 In the Home option, we will have a series of elements that turn out to be more like small shortcuts and highlighting functions, such as creating a PDF from an image or exporting it to other formats. In the View menu, we get the adjustment options for viewing the document. 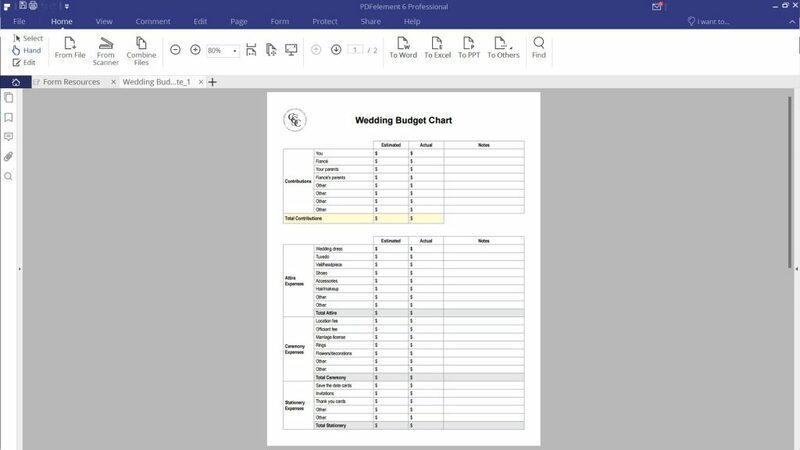 These are a bit more standard among other programs, so we are already familiar with the zoom methods adjusting to the screen or the view of multiple sheets in the same space. The Comment tab is where we begin to see the variety of editing tools in the program. In this section, we can highlight in different ways (through text editing, colors, or even figures and stamps) fundamental parts of our document. Text editing includes different underlines or even add carets for text inserts from another place. In the shapes, we will have from geometric figures to the always-useful free hand. If we want to give more personality, we can also use stamps, which can be customized or pre-installed in the software. The Edit tab allows us to add within the same text, content that will not be taken as simple annotations, but as part of the original file. In this way, the program detects any image or text box and prepares it so that we can modify it completely. We also find functions such as adding a watermark, page backgrounds or even cutting the sheet to a specific section. This part also has the option called OCR (we must download a plugin to use it), which is nothing more than the smart recognition of letters and images of non-digital documents or in non-editable formats of text, in such a way that PDFelement will be responsible for analyzing everything and create the corresponding edit boxes. 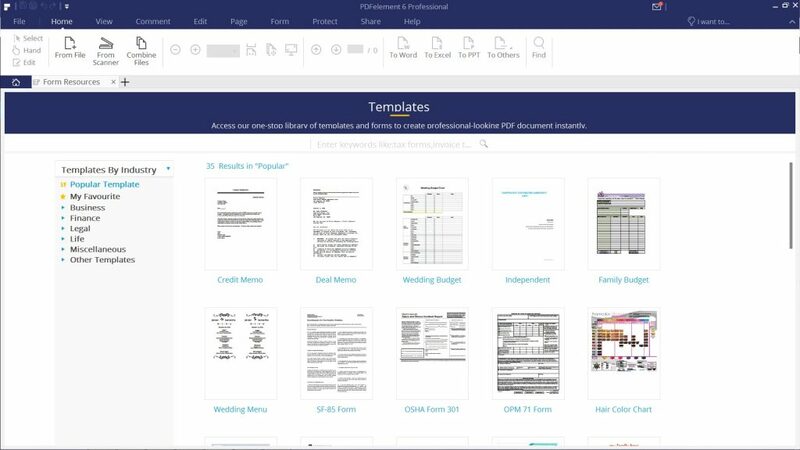 The Page section will allow us to modify the distribution of the document, or even insert new pages from other files. Additionally, it has a simple option to list the pages under our enumeration criteria. The Form tab is one of PDFelement’s specialties. In this part, we are allowed to create interactive PDF documents. These are just documents with editable fields when you select them without having to go through other options. These forms aren’t just text boxes; the tools are multiple and we can customize them with the shapes we want. We can create Check boxes, selection boxes, lists, buttons, and even fields to add digital signatures. Practically, we are facing options that will remind us of web pages. However, Smart functions do not end there. If we want to save time, PDFelement has a tool that allows it to recognize without our intervention, all those fields that could be editable, and will automatically create the corresponding boxes. This is one of the most complex tabs, where to know all its options; we would have to spend hours experimenting with them since we can even export or import data to these forms. Our options are practically unlimited. The Protect tab saves all the options with which we can give security to our document. One of the outstanding features of PDFs is that these documents can be blocked by means of passwords or digital signatures so that they can only be filled out by the authorized persons or in the boxes that we indicate. 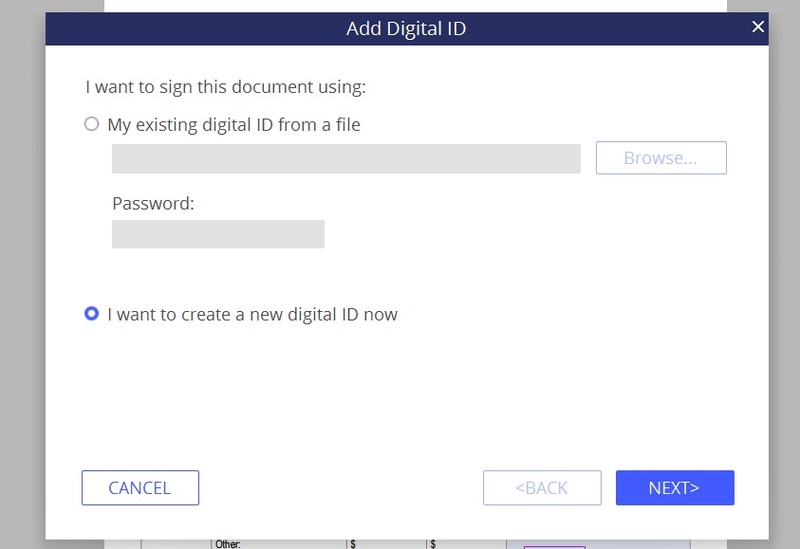 We have the most important options as users, which are to create passwords for the document and to assign a digital signature. If we do not have a signature, the program will allow us to create one that will be saved and we can use it for other documents. This will be encrypted and password protected, and PDF documents will detect if it is original. The Share option allows us to share the document directly to any of the storage platforms compatible with the program, such as Google Drive or DropBox, or we can send it directly by email. Finally, the Help option gives us all the help we need in digital manual formats from the official website, video guides, or an active forum with many users willing to answer your questions. We can also contact the official assistance service directly from this tab. PDFelement is a fast, light (only 118mb), intuitive and very striking program. 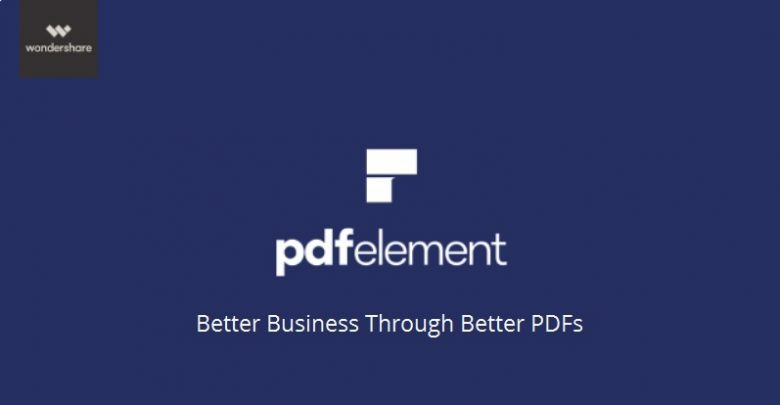 If you find yourself constantly handling documents in PDF format, you will know that these can be somewhat complicated to deal with, but PDFelement makes it very easy. Many customization options, great management of protection systems, quick shortcuts to create annotations and a wide community support the quality of this viewer and editor. For all our interested readers, we bring an exclusive promotion that will allow you to obtain an incredible price in this software. You just have to follow the following link to be discounted up to 40% to get PDFelement. Do not miss this unique opportunity!